Anyway, this is Sedaris' 6th book and contains the same witty vignettes and wily anecdotes about his life in France, his family, and ever-so-patient boyfriend Hugh. 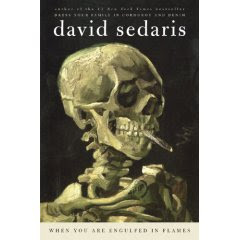 The title refers to the longest story in the book in which Sedaris travels to Tokyo in an effort to quit smoking. The great thing about all of David Sedaris' stuff is that it's all so relatable and quirky in a "yeah, you know you're right!" kind of way. Whether it's trying to keep spiders as housepets or fighting with people on an airplane, it's all good stuff.